Turopolje pigs are from Turopolje, Croatia. 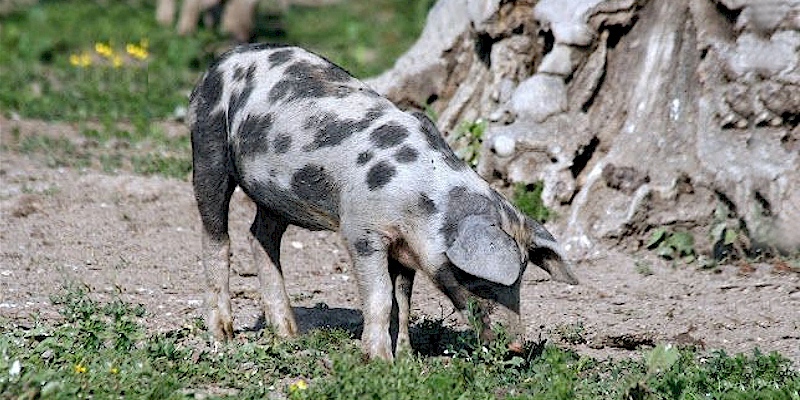 They are distinctive-looking swine, with black spots on their white or grey skin and drooping ears. They are very rare, and are likely nearing extinction. They are one of the older breeds of European pigs, though they may have had infusions of Berkshire or other bloodlines in the 19th century. Although Turopolje pigs are relatively small and not fast growing, they are known for their hardiness under free range conditions. They were once one of the most widespread swine in their native country, the change from extensive to intensive pig farming in the mid-20th century discouraged their use.